Lieutenant Colonel Roderick ROWE joined the Jamaica Defence Force (JDF) in January 1994 and over the period May 1994 to April 1995; he attended the Common Commissioning Course 942 (CC 942) at the Royal Military Academy, Sandhurst, (RMAS) in the United Kingdom (UK). On returning to Jamaica, he was commissioned in the rank of Second Lieutenant and posted to the First Battalion, Jamaica Regiment (Infantry) where, within a three (03) year span, he served in positions such as Platoon Commander, Intelligence Officer and Acting Adjutant. Lieutenant Colonel ROWE is a graduate of the Joint Command and Staff Programme (JCSP 34), held at the Canadian Forces College (CFC), Toronto, Canada, from August 2007 to June 2008; the Caribbean Junior Command and Staff Course (CJCSC), held at the Newcastle Hill Station, St. Andrew, Jamaica in 2004, and a Military Intelligence Officer’s Basic Course (MIOBC) held at Fort Huachuca, Arizona, USA in 1996. He holds a Master of Science degree in Engineering Management (MSEM) from the Florida International University (FIU) and a Bachelor of Engineering degree in Mechanical Engineering (with Second Class Honours) from the University of Technology, Jamaica. He is a registered Professional Engineer (PE) and a member of both the Jamaican Institution of Engineers (JIE) and the American Society of Mechanical Engineers (ASME). He also holds the global Project Management Professional (PMP) credential and is a Justice of the Peace for the Parish of Kingston. 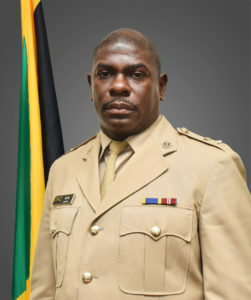 Lieutenant Colonel ROWE has served in most, if not all the technical Units within the JDF; holding appointments such as: Officer Commanding of the now defunct 6 Power Plant Troop (6 PPT), 1 Engineer Regiment (JDF), Officer Commanding Marine Workshop, JDF Coast Guard; Officer Commanding the JDF Workshop, Support & Services Battalion, and now as Commanding Officer of the Jamaica Defence Force Air Wing, home of the 1 Field Workshop. 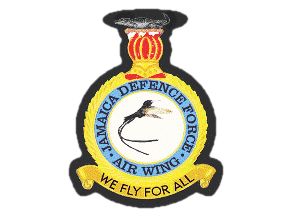 Prior to arriving at the JDF Air Wing, Lieutenant Colonel Rowe served at the Combat Support Battalion for a number of years as the Unit Second in Command and Chief Instructor at the Caribbean Junior Command and Staff College, and as the Unit’s Commanding Officer from June 2015 to September 2017. He is married to Nicole, and his military decorations include the Medal of Honour for Meritorious Service and Queen Elizabeth II Diamond Jubilee Medal (2012). An avid sportsman, he represented Jamaica in field hockey at the 1998 Central American and Caribbean (CAC) Games in Caracas, Venezuela. Over the years, he represented a number of organizations / institutions in one or more of cricket, field hockey, football and squash.